Australia's consolation win, England lifted the Urn and the era of Michael Clarke came to an end. Chris Rogers bid goodbye with the Australia Man of the series award. They say 'All is well, that ends well' , true. 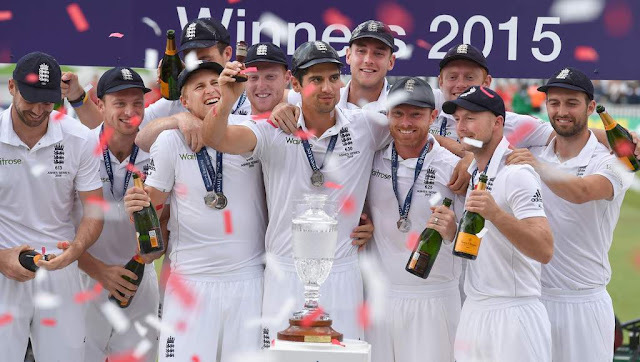 The Ashes 2015 are finally over with an invisible victory crown on Captain Cook's head but a visible elegant glory, the Ashes Urn in his hands. An incredible journey, Australia's collapse and England's 'new England' flourished and blossomed on the English soil. With moments like Alastair Cook's unmentionable injury to the drama of Oh My Broad!, yet again the Ashes series gave all its spectators a bag of memories which will be talked about in the future in one of the episodes of The Ashes Classics. England's victory and great acclamation of their efforts flowed in yesterday. The Englishmen's whites were glowing brighter than that of the Aussies. But there emerged another feeling that overshadowed the joys of victory, Clarke's retirement. Such is a game of cricket, passing on the vibes of happiness and sadness simultaneously. Perfect display of 'mixed emotions'. It will take time to overcome the fact that the era of Michael Clarke is over. Farewell to Australia's one of the best captains. Another great contributor of the game from Australia bid goodbye, Chris Rogers. The Oval's pitch added a hint of not being a seamer's paradise, the grassiness clearly spoke of bounce. The pitch didn't satisfy Alastair Cook's expectation and Michael Clarke's fear. The Australian batsmen finally adapted themselves to the English condition and stayed strongly on the crease while adding runs on the scoreboard. The play began at a slower pace as Australia could score only 14 runs in the first 11 overs but without a loss of any wickets. Chris Rogers and David Warner showed great application to frustrate the English bowlers. The play went on, and Rogers along with Warner went on for lunch without giving any breakthrough to their opposition. But after lunch, Rogers departed at 43 off Mark Wood. Later Warner failed to capitalize his great innings into a century and fell for 85, edged it to Lyth at first slip off Moeen Ali's spell. 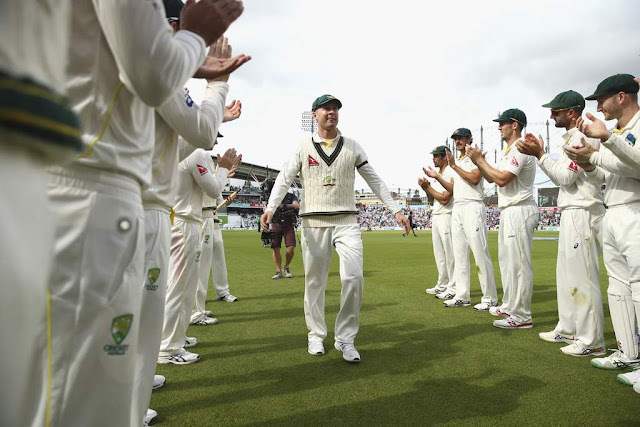 The number 4 batsman walked in and England provided a Guard of Honor, it was Michael Clarke. But soon enough Clarke fell on 15. But Steve Smith carried on to perform his duty and another 'glorious fifty' followed for the young run-machine. Later, rain interrupted for a couple of minutes. At stumps, Day 1, Australia ended the day with 287/3 on the board. With Australia totally owning Day 1, second day followed on with the same level of confidence. Adam Voges went on strong and scored his second Test fifty. Few minutes and few runs later, Ben Stokes gave England a breakthrough by breaking the 146-run stand for the fourth wicket. Voges' wicket fell on 76. M Marsh walked in, but didn't last long. His wicket came out surprisingly, 100th wicket for Finn. Steve Smith entered his nervous nineties and progressed to earn his 11th Test 100. As the Lunch time came closer, Moeen Ali dented the Australians twice, one in the form of Peter Nevill and another in the form of Johnson, two balls later. The next session after Lunch brought in quick runs for Australia from Mitchell Starc's bat. Steve Smith fell on 143 soon after Starc scored his sixth Test fifty. After Smith's departure it didn't take long for England to wrap up Australia's tail enders and Australia bowled out for 481. England's next strategy was clear, to score more runs and lose less or no wickets. But as the next session began, just before the Tea Break, England lost their first wicket in the form of Alastair Cook. England lost Ian Bell, Joe Root, Jonny Birstow and Jos Buttler in quick succession and slipped to 84/6 from 46/2 soon after the Tea Break. Few overs later M Marsh strikes back twice in one over to get Stokes and Broad out. Day two turned out to be a collapse of England at 107/8. Allowing Australia to score a massive score of 481 and then England itself collapsing severely on 107/8 on Day 2, plus adding more pain to this misery, the latter were 374 runs behind Australia's first innings total. Moeen Ali and Mark Wood began Day 3, in order to carry on for a bit longer to save their side from the severe misery as long as possible which they did for quite a while. England trail by 332 runs, and for the first time ever Michael Clarke enforced a follow-on in his Test career. The innings for England started all again, as the trouble of opening pair for England was in news before in the previous Tests, it somehow managed to continue the same way. Adam Lyth failed yet again, Siddle provided Australia with their first breakthrough before Lunch. After Lunch, the drama continued. Ian Bell managed to survive some close calls but soon his luck ran out and Clarke successfully carried his wicket at the second slip after missing out one before. 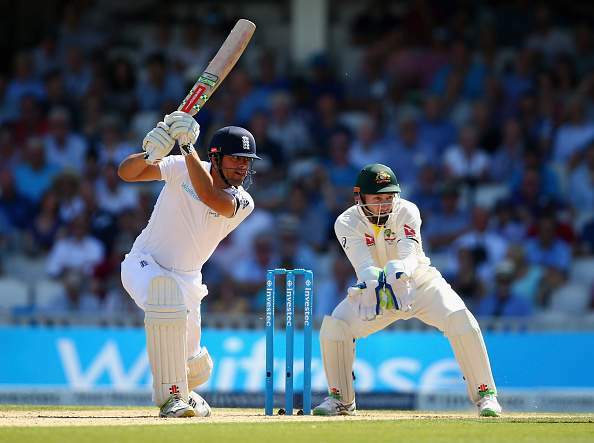 The England skipper Cook went on strong and scored his 44th Test fifty. Just after Cook's fifty Joe Root lost his wicket to Mitchell Johnson. A much needed breakthrough for Australia came in handy. England trying to save themselves on Day 3 ended up at stumps with 203/6 while follow-on against Australia. The Urn was already surrendered by the Aussies, but they eyed for a consolation win at the Oval. With 126 runs more needed for England to call Australia to bat again, victory in the final Test didn't seem a case for England any more. Jos Buttler and Mark Wood started day 4. Rain interrupted, wickets fell and finally England's innings ended. Australia won by an innings and 46 runs at the Oval. It was an emotional moment for Clarke and Rogers who played their final Test. The crowd cheered in acclamation, and the day marked as the end of Clarke's career. The Australian side gave him a Guard of Honor while the English side shook hands with one of the most remembered captains of Australia. The Ashes series ended, finally without a Day 5. England regained the Ashes 3-2 and Joe Root won 'Player of the Series' award.